As some of you know, I'm slowly easing my way into living a healthier lifestyle again. 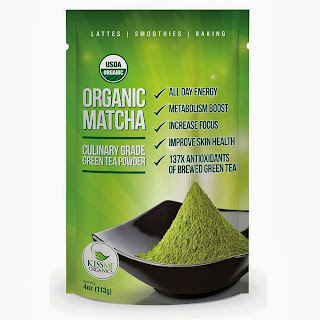 As part of that, I was thrilled the be chosen to review Organic Matcha- Green Tea Powder by KissMe Organics. I have to say that this whole experience was a good one. The company is very personable and easy to work with! For someone who thinks excellent customer service should be something that all companies strive for, this was certainly a plus. On top of that, they gave out a free recipe book to help get us going! With any luck, I'll have that uploaded somewhere online soon and I'll be able to share that with you too! I haven't had a ton of time to test this out, but everything that I've put it in has come out yummy! I'm really looking forward to having the time to try out making a green tea facial mask. After all, we all need to relax and take care of ourselves, right? I'm not a huge health nut or anything, and those who know me know that I'm still not a grown up because I don't really love tea or coffee. However, from time to time, I do like green tea. Funny how sometimes you like something and other times you're just meh, whatever. In this case, I'm glad to have this on hand for when I am in the right mood! Definitely a product worth checking out, if you're at all curious!